Infinity Hope Center’s motto is where hope never ends. This is clearly reflected through their site’s services. Treating the likes of depression, sleep disorders, ADHD, and anxiety through different forms of therapy, Dr. Thompson is the mastermind behind the website. Servicing the community for over 20 years, Dr. Thompson has extensive experience in clinical staffing, mental health, urgent care, occupational health, and emergency care. Her techniques include physical medicine, alternative therapy, and pain management. In homage to the therapy Dr. Thompson provides, we created a lax website that would reflect the mood of the therapy. We went with a simple, subtle design that would draw readers into the information provided. Just like therapy and meditation, we did not want the website to be extremely crowded and daunting. We went with open navigation and lots of open space to keep the information flowing nicely. A clean and elegant style that matches the mental health specialty. We stuck to a simple color theme for Infinity Hope Center. We primarily white text with a wide black background to add contrast and make the words pop. White implies a sense of professionalism and adds a touch of modernism on any website. The black background throughout the website gives a sense of luxury and class. This also places additional emphasis on the photos – all of which are directly reflective of her work. We also added a navigation menu that allows for optimal browsing and rich special effects to add a touch of modernism for the website. We kept the interfaces clean for the most part; we wanted open space to allow patients to openly explore their opportunities with Dr. Thompson. The main navigation tool for Infinity Hope Center lies in the navigation menu. We specifically placed different tabs for the services provided. There is a helpful FAQ available for incoming patients as well as links to Dr. Thompson’s educational blog. 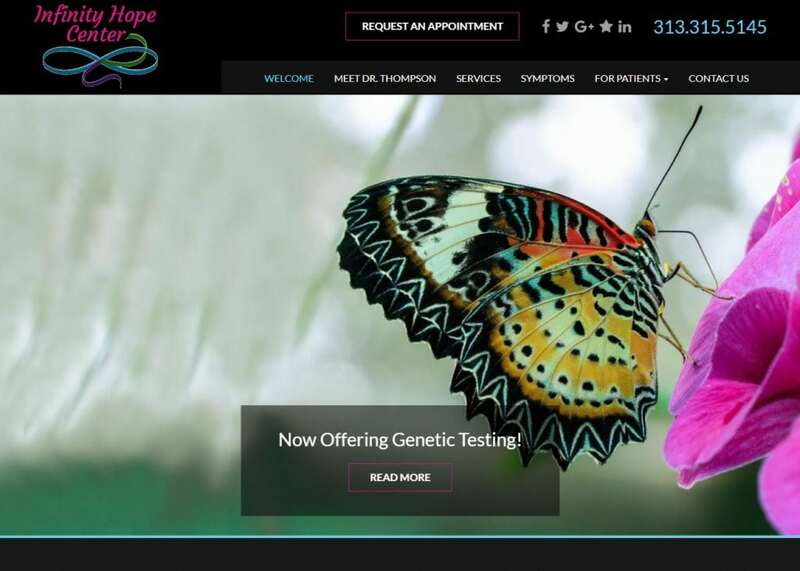 With situations like this where a specialty is usually a form of alternative medicine or therapy, we gravitate towards simplicity when it comes to website design. Not only does this help fit the mold of the theme, but also helps keeps readers reading without all the fancy flashing lights that come with overbearing website designs. From the smiling images scattered throughout the website to the typography, the website represents the careful planning and effort that the professionals place into their craft. The vibrant colors and images encompass the website giving visitors the impression that the profession is approachable and friendly.